I once lived in an apartment building designed with door handles that looked good but gave no clue as to whether they were to be pushed or pulled. This was a case that cried out for the old fashioned kind of information architecture, in which the architecture supplies the information. 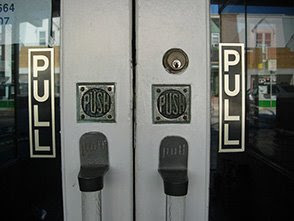 Since there was none, hand-lettered “Push” and “Pull” signs were supplied by the doorman, whose day job plainly was not calligraphy. There is more at stake here than aesthetics and convenience. Clarity of ingress and egress can be a matter of life and death. On-site accounts of the tragic 1911 Triangle Shirtwaist Factory fire report that because the only doors that were not padlocked opened inward, panicked workers trying to escape couldn’t open them because of the even more panicked workers pushing at their backs. Have you recently found a very confusing sign you want to bang your head on it? :) Email them at houseofonika@gmail.com.